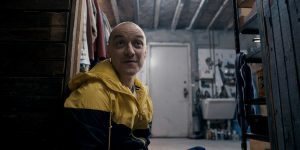 SPLIT Is the new film directed by M. Night Shyamalan and stars James McAvoy, Anya Taylor Joy and Betty Buckley. This is a psychological thriller about a man called Kevin (McAvoy) who has dissociative identity disorder. There are 23 personalities living inside Kevin’s body. (Betty Buckley) plays Kevin’s psychiatrist, Dr. Karen Fletcher, who tries to help Kevin with his condition. The film starts when one of the personalities abducts three teenage girls (Anya Taylor Joy, Jessica Sula and Haley Lu Richardson) and are taken to an unknown location. The film focuses on the girls as they must try and find a way to escape as well as cutting back to Kevin visiting his psychiatrist who unbeknownst to her of what Kevin has done. Director M. Night Shyamalan has come under a lot of scrutiny over the past years with underwhelming films such as ‘The Last Airbender’ and ‘The Happening’. 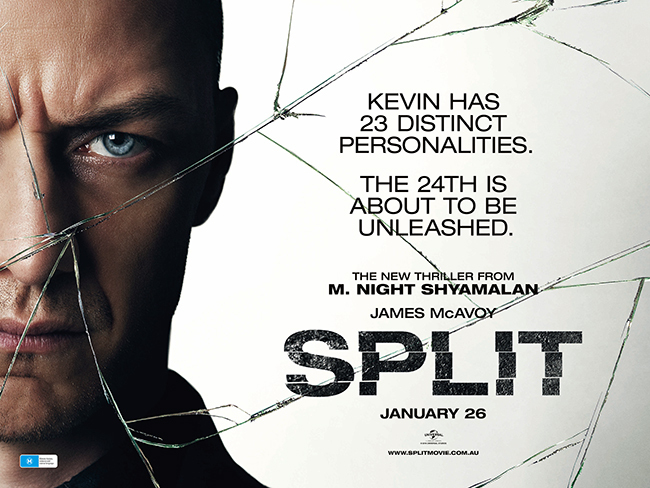 With this film, Shyamalan successfully delivers with Split as this is a very good psychological thriller and is easily Shyamalan’s best film in years. It was great watching Shyamalan go back to his roots with his past great films such as; ‘The Sixth Sense’, ‘Unbreakable’ and ‘Signs’. The Three main performances are that of Betty Buckley, James McAvoy and Anya Taylor joy. Betty Buckley does a great job playing this psychiatrist who desperately wants to help Kevin (playing by McAvoy) with his condition. Some of my favourites scenes are of Karen as she talks to Kevin on their sessions together as she tries to delve into Kevin’s psyche. The standout of this film by far is James McAvoy who gives what is his best performance to date. McAvoy fully embraces this role and has a lot of fun in doing so. The way McAvoy transforms into a different personality seamlessly was fascinating to watch. McAvoy’s brilliant use of his vocal patterns and mannerisms, is what makes each personality shown onscreen is very distinct from the rest. One personality in particular, a 9-year-old boy called Hedwig was very funny and entertaining to watch. I’d imagine this role could have been a risk if not cast properly, but both Shyamalan’s writing and McAvoy’s performance do an excellent job of pulling this off without it turning silly. Anya Taylor-Joy also gives a very good performance here playing one of the girls that McAvoy has abducted. I loved her character in the film, there was a really good mystery surrounding this character, and seeing her arc in this film was great to discover as you’re not really sure why she is the way she is. As the film goes on, your able to discover these things which makes Taylor joy’s character all the more compelling. This however leads to my negative. The writing was kind of sloppy at times concerning the other two girls who are abducted along with Taylor Joy’s character. While their performances were fine, the writing here feels weak as their characters were under developed due to Shyamalan choosing to focus on the lead girl. However, despite this, as each act goes on, the film slowly starts to reveal itself and builds to a really tense finale that keeps you guessing till the very end. Split was a lot of fun and thrilling from start to finish and is most certainly M. Night Shyamalan’s best film in years. 4/5. Tahmina Uddin is currently studying her final year at London Southbank University. From a young age she had a keen interest in writing, as well as reading. These interests sparked her desire to seek a career in English. As her final year slowly comes to an end, she hopes to use her degree to pursue teaching children to better understand the English language and develop a love for reading.